Hi guys, I'm back for a second day in a row for another PPU shade, this time from Noodles Nail Polish. Again, this month's theme is musicals, and Natalie was inspired by the movie La La Land with Emma Stone and Ryan Gosling. Don't be mad, but I haven't seen this movie either! I 100% planned to because I love Emma Stone. What a Waste of a Lovely Night will be available on Friday, Aug. 3rd at 11 AM ET through Monday, Aug. 6th at 11:59 ET for $11 with a cap of 200. Let's get a closer look at this warlock. What a Waste of a Lovely Night is a deep indigo jelly base with UCC flakes, blue to purple flakes, fine silver flakes, and sapphire glitters. It will look blue or purple depending on the angle. I used 3 thin coats for my swatches, mostly because bright lights for photography tend to make VNL more evident. Most people would be able to get away with 2 coats easily. It dried with a bit of texture from the glitters, so make sure to use a thicker topcoat with this one. Yet another beauty from Noodles Nail Polish! 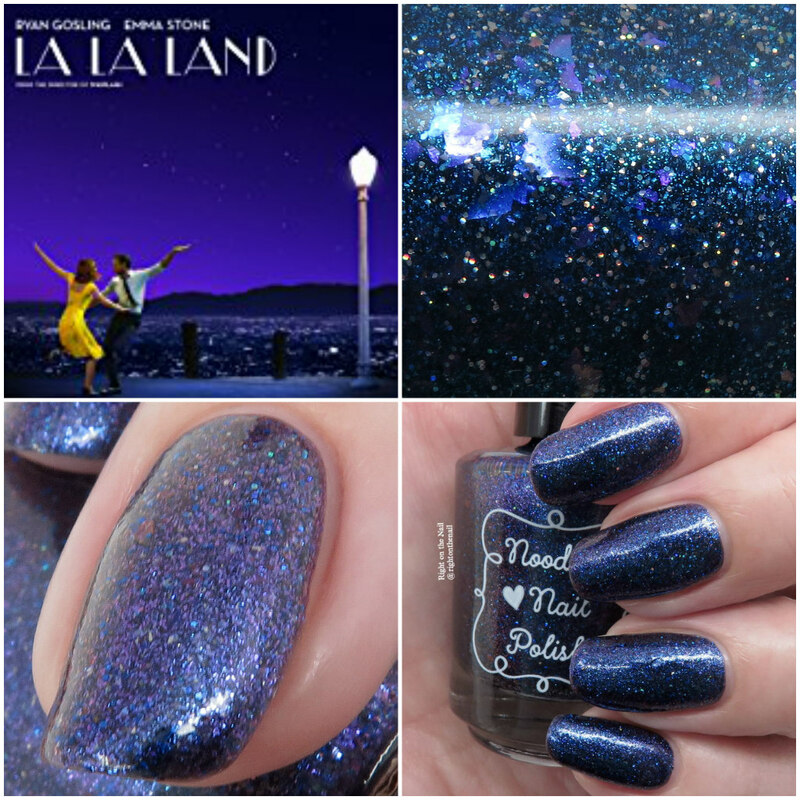 The color matches the cover of La La Land perfectly, and I love the depth the flakes add. Again, this one is available from Aug 3-6 for $11 with a cap of 200. You can find out more about Noodles Nail Polish on their website, Instagram page, Facebook page, and Facebook Fan Group while you can learn more about the Polish Pickup on their Facebook page and website.